The talking wall is a sealed air tight wall mounted voice communicator. It can be installed on glass or plexiglas window, doors and thick walls. The talking wall operates by using a thin durable Mylar diaphragm for sound transfer. This talk through window allows for both visual and oral communication even when mounted in a solid wall. 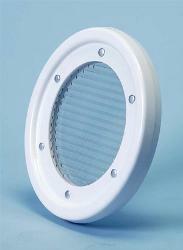 White plastic frame mounts on both sides of cleanroom wall or window.